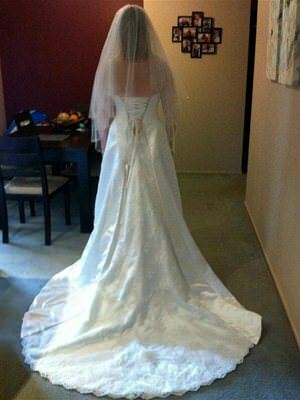 STUNNING DRESS NEVER BEEN WORN!URGENT SALE<br>unfortunately i never got married , never got to wear dress.<br>Im moving oversea in a week!! !<br>The dress is a stunning dress i have only worn in this pic and at time of purchase.<br>i am now a 14 so doesnt fit me as well. it fitted me like a glove when i was a 12 and very flattereing.it has a insert for the back.<br>THE DRESS<br>is size 12 no alterations made<br>Purchased at Fairytales.<br>Veil 37 inches from the comb to longest point.<br>53 inch from top of the dressfrom the front to the ground.<br>75 inches from the top back to the bottom of train.<br>! 'm 5'9 in pic with no shoes on<br>The dress in stunning and in its origianl zip up fairytale bag, . In immaculate condition.<br>origianl price 1881 dress , veil 198<br>asking price 1200, pick up prefered or u can organise postage.<br>any quesions please contact me kind regards lisa<br><br>Strapless A-line gown,in delustred satin<br>Featuring a off centre beaded corded lace insert and bodice. 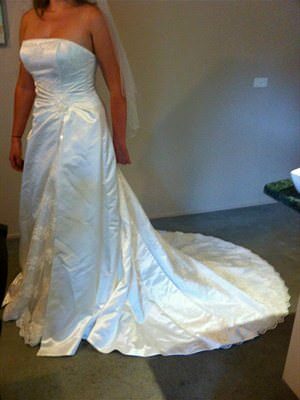 Including lace insert from waist to train lace up back, zip to waist,<br>Ivory colour<br>Size 12<br>Ivory veil included soft curved diamonty edging.<br>Dress is in immaculate condition, dress only worn on this purchase and for this photo, no ulterations have been made.